Just like humans, dogs can suffer from hearing loss and deafness. In honor of National Deaf Dog Awareness Week (September 23-29), here are some key facts all pet parents should know about hearing loss in pets. • Lack of response to sounds, such as doorbells or squeaky toys. • Sleeping through loud noises. • Difficulty waking or startling when woken up. Hearing loss or deafness can be caused by many of the same factors as humans. Some dogs are deaf from birth; approximately 30 breeds, including Australian Shepherds and Dalmatians, are known for having a higher risk of congenital deafness. Other dogs lose their hearing over time, due to expose to loud noises, injury or blockage by a foreign object, such as earwax buildup. Hearing loss can also be caused by medical conditions, including old age, infection, tumors or exposure to toxic substances. 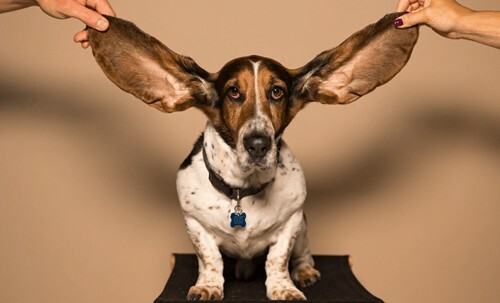 If you have a customer who thinks their dog is experiencing hearing loss, the first thing you should tell them is to consult with a veterinarian for diagnosis. A few causes of hearing loss can be treated or even reversed, but most are permanent. Luckily, quality of life for pups with hearing impairment can be very high with simple lifestyle adjustments. Tell customers that, rather than communicating verbally, they can train their pets with hand signals. They might also want to consider investing in a vibration collar, which gets dogs’ attention with gentle vibrations. Owners should also be extra vigilant when caring for pets with hearing loss. Dogs should always be kept on a leash when outside the home, since they can’t hear potential dangers. FCVC hopes all our pet owners are aware of their pets unique sets of behaviors and what may need to be done to adjust to them. If you need help in understanding a condition you are experiencing with your pet friend, please give us a call so we can help you with it. 970-587-5140.